Republican lawmakers who backed the 10-cents-per-gallon gas tax increase know that various irate constituents might be waiting at home to give them an earful on their spring break next week. But the coastal Alabama contingent will be able to point to a very tangible benefit from their supportive votes: a deepening and widening of the Mobile ship channel. Tax revenue from the Rebuild Alabama infrastructure package will supply the necessary state match for the Alabama State Port Authority’s $400 million ship channel project. It was the only specifically named project in Rebuild Alabama and the only one that wasn’t a road or bridge. “When that wound up in the bill, there was no way to vote against it,” state Rep. Chris Pringle (R-Mobile) said. Some coastal lawmakers say the inclusion of the port project got them on board with the state’s first fuel tax increase since 1992. The tax revenue will supply $150 million for the channel work. Alabama State Port Authority CEO Jimmy Lyons sees the state’s channel match not so much as a political win as a necessity. He said Mobile faces fierce competition from other deep water ports, such as Savannah, Ga., and Charleston, S.C. Without a bigger channel, Alabama could get left behind, he said. Indeed, the support for the expanded ship channel project in Mobile was far and wide. Among the backers was Huntsville Mayor Tommy Battle, whose city is more than 350 miles from Mobile. Battle said the larger channel will allow movement of more cargo and reduce shipping costs. “Our thoughts are that it will be good for Mobile, but it also will be good for Huntsville,” he said. Very few disputed the addition of the ship channel project during the Legislature’s debates. Most lawmakers, no matter where they hailed from, praised the project and its wider impact on the state. The project involves deepening the channel by 5 feet, to 50 feet in most locations through Mobile Bay. One particular channel would be deepened to 52 feet. The channel would be widened to provide room for two-way ship traffic. A turning basin also would be widened by 250 feet. The 10-cents-per-gallon hike signed into law March 19 in Montgomery may have been the final gas tax increase in Alabama. Why? The emergence of mileage-based user fees. Even with state money dedicated to the channel project, construction isn’t happening soon. The project still needs to win permit approval from the U.S. Army Corps of Engineers, and the federal agency still has to conduct a series of public hearings before it can move forward. The project’s critics include a host of environmental activists and entities wary of a widened channel’s impact on oyster reefs and other sensitive habitat, and on Dauphin Island beach erosion. Lyons said he anticipates engineering and design being completed during the summer of 2020. If federal money is appropriated during the 2021 fiscal year, he said, construction could start as early as October 2020. U.S. Rep. Bradley Byrne (R-Fairhope) said earlier this week that he could see the ship channel project occurring at the same time as the construction of the Interstate 10 Mobile River bridge that is estimated to cost $2 billion. “You will see two major things happening in that part of our area, and that will have an enormous impact,” Byrne said. Lyons said that the Alabama Highway Finance Corp. will issue bonds for the channel project when work begins. Thus, no gas tax revenue can flow to the project any sooner. Lyons predicts the bond term to be 20 years. Pringle and others also will be paying close attention to news emanating from the office of U.S. Sen. Richard Shelby (R-Tuscaloosa), who is the first Alabama senator to chair the chamber’s Appropriations Committee. “This is his No. 1 priority in getting that ship channel widened and deepened,” Pringle said. Pringle and other lawmakers said that Shelby was instrumental in lowering the state’s matching requirements. Lyons said that rival ports are in the midst of expansions, which, if left unanswered by Mobile, could win them deep-water ships that might otherwise have come to the State Docks. The shipping channel serves as an international gateway to Alabama. The Port of Mobile ranks No. 9 in the United States for total cargo tonnage, according to the latest available data. It ranks No. 40 in value of imports and No. 69 in value of exports — potent showings considering the rankings involve approximately 400 U.S. ports in all, coastline and inland. Mobile’s biggest imported product last year was crude oil from petroleum and bituminous minerals, with airplane and helicopter parts placing a distant second. The city is home to Airbus’ largest North American manufacturing plant. The Port of Mobile exported $4.7 billion worth of goods in 2018. The most popular exports were polyamides, wood pulp, crude oil, chemical-industry products and residuals, soybeans and chicken. China and Mexico are tops among the countries doing business in Alabama, data show. “There are large nearby competitors, and if larger containerships cannot make it inside the harbor, then traffic will go elsewhere and then move to Alabama by rail or truck,” McNab said. The most cited example by Lyons and others in Mobile is Savannah, where a channel deepening project is underway and expected to be completed next year. Georgia is paying for its share of that project with $231.1 million in bonds. 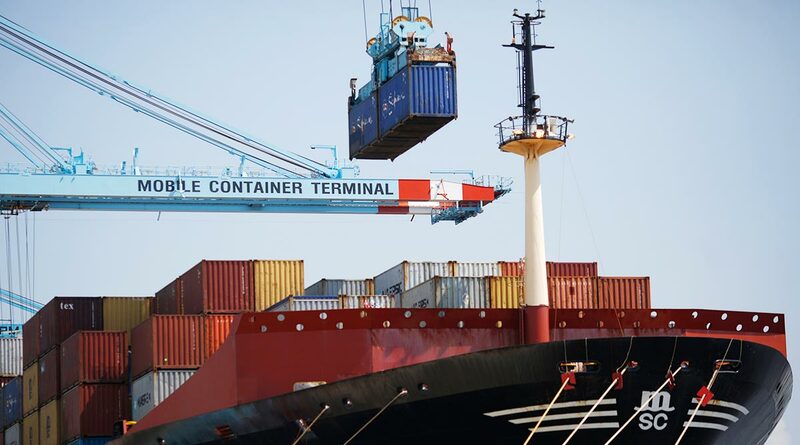 Data show that the Savannah Harbor exported $74.4 billion in goods in 2018, or six times more of the value of what was exported out of Mobile. Competition is particularly fearsome along the East Coast, where ports appear to be in a race to get their dredging and widening projects finished quickly. In Jacksonville, Fla., local media reports indicate that the Jaxport deepening project, originally scheduled for completion in 2025, will be moved up two years earlier, thanks to increased funding. Norfolk Harbor in Virginia already has the go-ahead from the U.S. Army Corps of Engineers to launch its channel deepening and widening project. The competition goes beyond dredging. In Charleston, a $762 million container terminal is under construction. Five new super post-Panamax cranes will be added to the new terminal in late 2019, and the entire facility will be about double the Port of Charleston’s current capacity. In McNab’s view, Mobile’s channel project will allow the port to “retain” its market share. To grow the share, he said, the port will have to develop further infrastructure for cargo transportation, warehousing and processing. Mobile has seen investments into its port in recent years, highlighted with the Port Authority and MTC Logistics announcement last year on plans to build a $58 million, international temperature-controlled distribution center.